This is a coffin or crematory vessel. It is constructed without the use of metal fasteners or hardware. Corner inlays are made of ebony. It will completely degrade, leaving no metal residue. The cloth screen was substituted for a solid top. 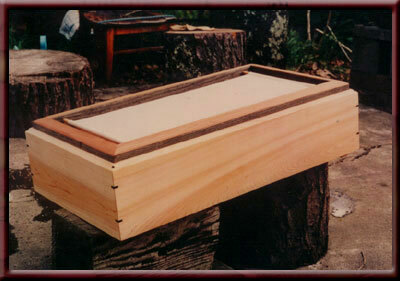 It is available in a variety of sizes, woods and selection of cloth. Unfinished.